There has been a lot of speculation and misinformation concerning the deployment of RCMP officers during the assault on the anti-fracking blockade in Rexton, New Brunswick (in Mi’kmaq territory) on Oct 17, 2013. So much, in fact, that I have been inspired to provide this brief overview of the RCMP deployment, units, weaponry, and tactics. First, let’s deal with one of the more outlandish claims being asserted about the RCMP assault by conspiracy theorists: the alleged presence of US military personnel. It has even been suggested that these soldiers were members of the US Army Delta force, the most secretive and elite of all US special operations forces. This bit of misinformation appears to have resulted from the choice of camouflage fatigues used by the RCMP’s Emergency Response Team (ERT) that accompanied the regular RCMP officers. RCMP K9 unit attempting to intimidate protesters, Oct 17, 2013. Not Delta farce, but an RCMP K9 unit attempting to intimidate protesters, Oct 17, 2013. In this photograph, a K9 unit officer attached to the ERT (it is normal practise for ERT units to have K9 units with them) can be seen wearing Multicam, developed by Crye Precision. This camouflage was recently adapted by the US Army for operations in Afghanistan and may become standard issue pending the results of a competition to find a new camo pattern. Apparently, some people have seen this camo pattern used by the RCMP ERT in New Brunswick and wrongly assumed they were US soldiers. 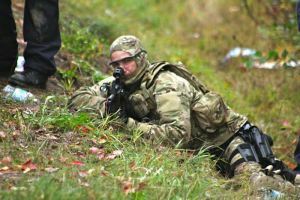 Multicam, in fact, is in use among many military and police forces (including the British military). The photograph above in particular was circulating as “proof” of the presence of the US Army Delta force because of the triangle shape on the officer’s baseball cap. This, it was claimed, was the insignia of the Delta force. In reality, Delta does not wear insignia on its combat fatigues (it’s super secret!) and the insignia in fact is the nose piece of this cop’s protective eyeglasses. You can also see on his left shoulder the RCMP shoulder badge and a police tag across his chest. RCMP ERT member from Prince George, 2009, wearing MARPAT, the camo pattern used by the US Marine Corp, armed with C7 rifle. While it is common for RCMP ERT in urban areas to wear black fatigues, there appears to be no standard camouflage uniform that individual units are required to wear, and this may indicate that they can pick and choose what they feel is best for their particular geographic region. via Overview of RCMP deployment against Mi’kmaq blockade, Oct 17, 2013 | Warrior Publications.